Eye disorders due to Deficient Liver and Kidney Yin with Empty Fire, with symptoms of poor vision, vertigo, photophobia, excess tearing of the eyes, night blindness. Also dizziness, ocular vertigo, itching eyelids, constipation, dry mouth, dry throat, tinnitus, night sweating, fatigue. Retinitis, optic neuritis, vitreous opacity, swollen red eyes due to Wind-Heat. Golden Lily Brand – Tianjin Medicines & Health Products Imp & Exp Corp. 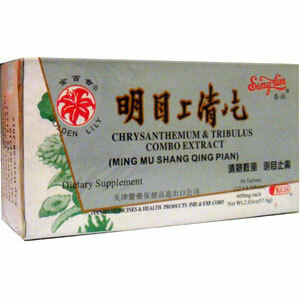 This formula, Ming Mu Shang Qing Pian is specifically formulated to strengthen the eyes and improve vision. Nourish Liver and Kidney Yin, strengthen vision, antidote, carminative, anodyne. Take 4 tablets, 2 times a day with warm water. Do not take if you are pregnant or nursing. Do not use if you have cataracts. Be the first to review “Ming Mu Shang Qing Pian” Click here to cancel reply.